I have noticed in gameplay that the pakset does not currently have a flat crossing for railway over canal or river, instead requiring earthworks be used to achieve a raised crossing. There are many precedents for lifting bridges, from the earliest days of railways e.g. 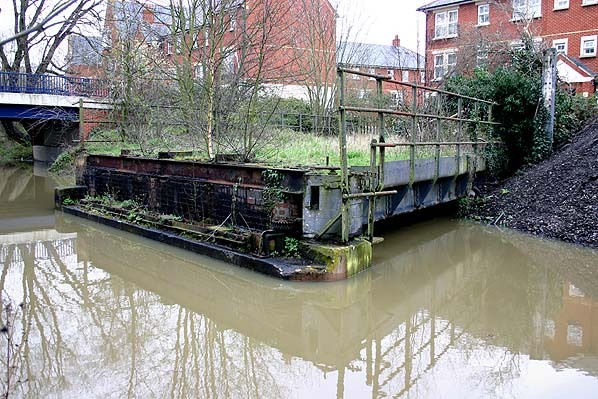 below a replica from the Leicester & Swannington railway, and the Rewley Road swing bridge in Oxford, now disused but protected. - note the water level is only a couple of feet lower than the trackbed (the later raised GWR line is in the background of the photo). I think this is a feature we need in the game. Pak128 has a bridge for this scenario (it resembles the 1960s Kingsferry Bridge) so the code for a bridge opening and closing already exists, it just needs some period pak-gb graphics. I'm unsure if any wagonways of the eighteenth century had such a bridge but I would have thought it possible, given their use in connection with canals and simple engineering, so a basic one with a very early intro date might be wise, then a better one for steam railways. It is possible in principle to have a swing or lifting bridge graphic produced as a crossing type in the pakset, but it is not possible to make this cost any more than an ordinary piece of track. Adding code to change this would be a significant new feature (a swing bridge is not truly an at grade river crossing; the only feature that can properly use this between a river and a land based way is a ford, so the changes required to the code would be complex and far-reaching), and this is not currently a priority. Ah, so it's a cost balance issue (being a "cheap" way to get a bridge). Worth noting that using high level fixed bridges instead also comes with an unbalanced cost - the extra earthworks necessary to get up to that height and down again. Even if the cost of the bridge itself is "correct", their use is "too expensive" just the same as the alternative would be "too cheap". So faced with two unbalanced options, it may be better to introduce the flat crossing just to minimise the impact? I do not understand why the necessity to raise the level of the rail/road above the river is unbalanced; in reality, wherever a railway or road is at exactly the same height as a river, it is necessary to create ramps for a higher bridge just as it is in Simutrans. 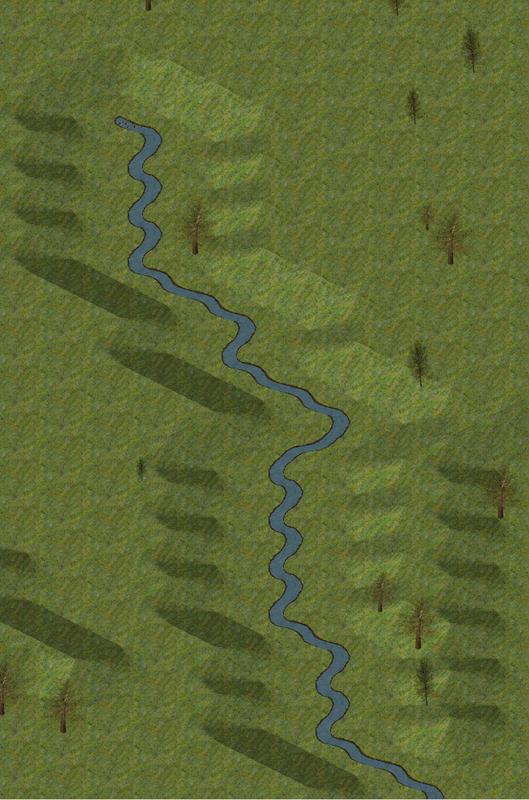 In many cases in Simutrans, just as in reality, the river has carved a route lower than the surrounding land. In real life water level is not at the same level as ground level, or you have a swamp. 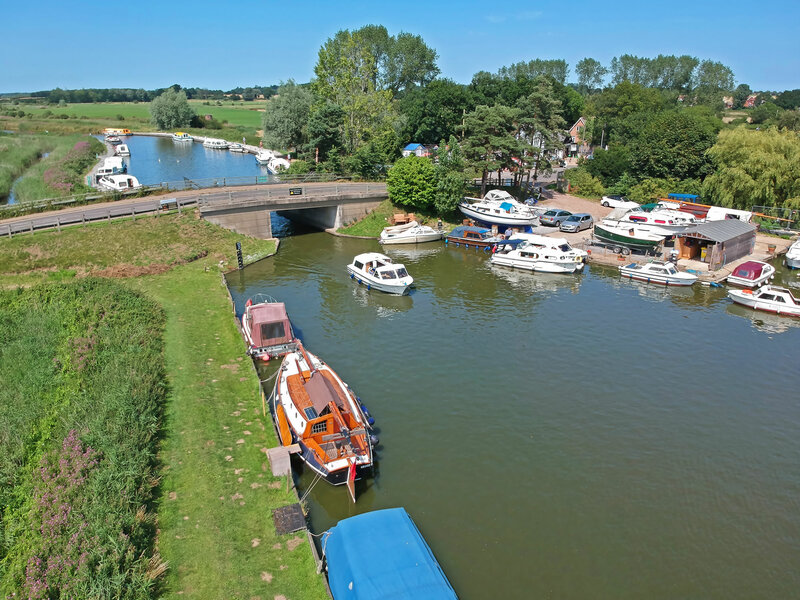 Rivers and canals always have their water level set a foot or two lower than surrounding ground. Simutrans does not simulate this. In reality, rivers carved channels, and the water table lowers slightly in consequence, canals copy this. Given both these things, it's certainly possible to have a river or canal crossing without approach embankments, as the picture of the Rewley Road swing bridge shows. Yet in Simutrans we cannot. The lowest Simutrans embankments do not seem to equate well to this essentially flat crossing scenario. It is generally not possible to build a bridge of any substance entirely level with the surrounding terrain (whether swing or otherwise) in such a configuration. The bridges that you depicted showed the water some substantial distance below the surrounding ground, that is approximately equivalent to a half tile difference in height, as is common, but not universal, for river channels in Simutrans. Simutrans rivers and canals don't have channels. It's more common to see the river graphics on the perfect flat with adjacent fields than in a little ditch. You are surely exaggerating with your use of the word "substantial". The Rewley Road swing bridge is effectively at water level. what do you consider the vertical scale of the pakset to be?! The photo you show is of a much wider river, but it's certainly possible to engineer a flat crossing, even on a wide body of water. : Use a truss with the deck set between the lowermost horizontal members. It's easier on a canal because the water level doesn't go up and down, no floodwater to account for. The vertical scale is not calibrated precisely, but where river and ground are on the same level, they are indeed on the same level. The Rewley Road example has a difference in height between land and water that can be measured in meters, not centimetres - this is what I meant by "substantial". In any event, whenever the river is a navigable public right of way, the bridge must be high enough to allow boats to pass underneath. Where it is not a navigable public right of way, it can simply be put into a conduit (deleted). The map generation algorithm does generate some rivers on the flat (as in the pictures above), although also very often generates channels. Your picture above could very well be port meadow in oxford; right next to rewley road swing bridge. There is no need to ramp up in that scenario unless you want to avoid an opening bridge, which clearly is what the highways engineer has done. I don't think that that makes any sense - it is clear that there is a significant height difference (measurable in meters rather than centimetres, unlike the above image of the Norfolk Broads) between land and water at Rewley Road, and it is not much relevant that there is no such difference a relatively short distance away. Whether you define the canal as in a slight ditch or not, I don't think a bridge could physically get any closer to the water level. By my eye the trackbed is about 900m above the water level (counting bricks). Here is a better photo, from this website. In any case, the 'shallow ditch' in simutrans (1 level altitude difference) as your screenshot, will require a "low bridge" - which prevents the passage of ships. So even if that is the answer to all such scenarios ... we need an opening "low bridge" instead of an opening "flat crossing". Which we haven't got in the game either...! It is clearly quite often necessary in reality to build up the sides of a bridge in order to cross something that would otherwise be flat: the same applies to roads and railways as well as rivers. 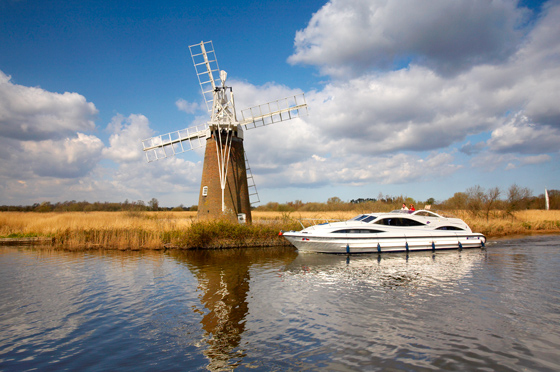 This is common and ordinary, and the example given from the Norfolk broads shows this in use. The Rewley road type of bridge is extremely rare. As already explained, without major code alterations (which would take time away from more important projects), a river level crossing could not be achieved without unbalancing the game by making the bridge effectively free. Perhaps one day there will be time to add a mechanic to have chargeable swing bridges with realistic maintenance costs, and all the graphics to go with them. As to the issue of a height for navigation, the only alternative to doing it this way is to allow players to block other players' routes when the other players use public rights of way, which would be a bigger problem. You can build a low bridge over a stream, as this is not navigable.